Polaroid isn't going to be making instant film anymore, so I'm pretty psyched that I got this trippy double exposure of Jasper. Sure, you could get the same effect in Photoshop, but this was a total lucky fluke. I'll miss crazy pictures like this but not the $1 per shot hanging over my head. Now that's a great photo without needing to use photoshop. No more instant film? 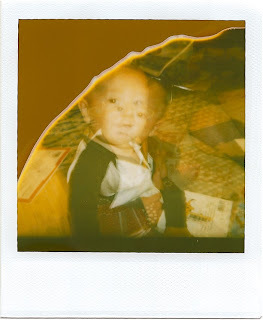 I was polaroid-crazy when I was about 6. I got a camera for my birthday and took dozens of pictures of my stuffed animals in various poses. Well, "poses". They couldn't really move much. This picture takes me back, and makes me a little dizzy, too. Those are my favorite kinds of pictures!